Senior member of the Democratic Front for the Liberation of Palestine says Hamas is now denying contacts with Israel on a long-term truce. 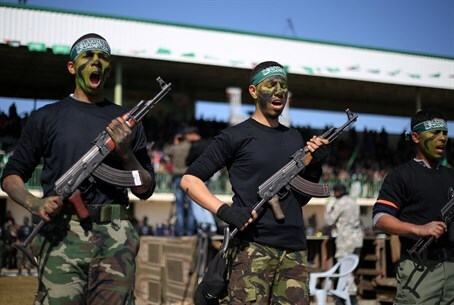 Hamas has denied that it has been holding secret talks with Israel and that it had reached a long-term ceasefire agreement with the Jewish state, the Ma’an news agency reported on Wednesday, quoting a senior member of the Democratic Front for the Liberation of Palestine (DFLP) group. According to the official, Saleh Zeidan, Hamas’s denial came in a meeting of Palestinian Arab factions that included Hamas, the DFLP, the Popular Front for the Liberation of Palestine (PFLP), and Islamic Jihad. Zeidan added, however, that Hamas must also issue an official statement affirming its denial. He warned that any unilateral long-term agreements between Hamas and Israel would have "dangerous consequences" and would be to the benefit of an Israeli plan to “separate the Gaza Strip from the Palestinian national project”, according to Ma’an. On Tuesday, sources in Hamas were quoted as having said Israel and the group have been holding indirect contacts about ideas for cementing a long-term truce in Gaza. An Egyptian-brokered truce came into effect on August 26 of last year after a 50-day war between Israel and Hamas, with the sides pledging to resume indirect contacts within a month to pin down a lasting ceasefire and discuss crunch issues. Indirect exchanges between the two sides come as past weeks have seen sporadic rocket fire towards Israel from Gaza, most attacks claimed by the Salafist group Sheikh Omar Hadid-Bayt al-Maqdis, which is aiming to challenge Hamas' rule in Gaza.